How do I pause a macro when a condition is met? I have a macro that performs a series of functions on a multitude of tabs. I don't want to stop the macro, I want it to pause it at a specified sheet so I can step through it, and then if it works properly, resume the macro. Once the above condition is met, the code will pause at Stop and then you can debug the rest of the code. Stop can be used if meant unconditional. If you want to check a condition, use Debug.Assert «Condition» with «Condition» needing to be False to stop. Background: That command is used in cases where you want to be sure the checked condition is true for further processing, e.g. objects are valid; otherwise stop into the debugger. Quelmo, correct me if I'm wrong but I believe that Debug.Assert is only recognized while debugging and that doesn't seem to be what the asker wants. The same thing for Stop, and I believe the only way to "pause" a macro is to Exit Sub. Exit Sub is no pause, it is an exit, leaving the current procedure, without any means to continue execution. Stop and Debug.Assert are debugging commands, that is correct. But that is what the Asker asked for - a means to execute until a certain code part, than single-step or continue execution. 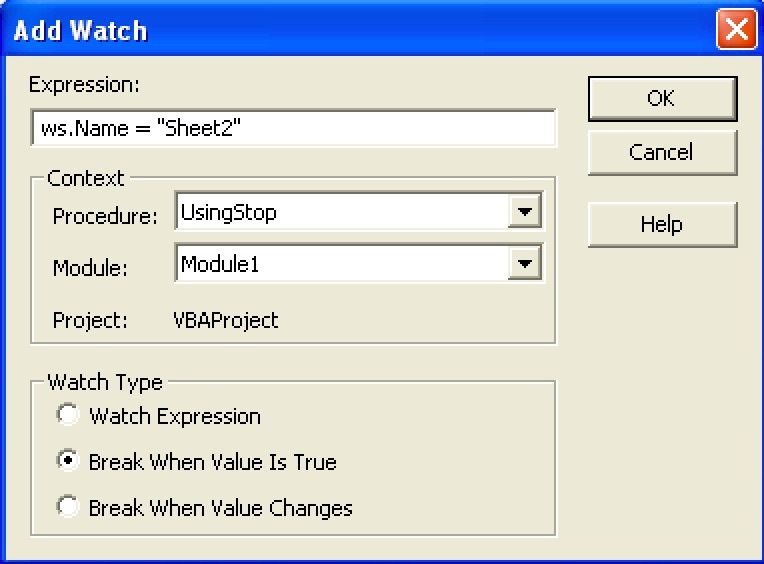 This is debugging, and the debugger is part of VBA. gabriel, the easiest way to pause a macro while debugging is to put a breakpoint at the line where you want it to pause. When you run the coded the macro will pause there. You do that by clicking in the left-hand margin of the line. You may also be interested in this article I wrote on debugging. Here is a simple code which iterates over the sheets in the workbook and perform some actions on each sheet. Objective: Asker wants to debug the code before the code performs those actions on Sheet2. The following sample codes demonstrate the use of Stop, Debug.Assert and Breakpoint for the same scenario. So any method can be used based on the requirement and I normally prefer Stop and Breakpoint. End will also do the same but will clear any Global variables. The problem with using Stop is that you would have to remember to remove that line(s) of code before the workbook went into production or you might get a surprise months down the road (depending on the rarity of the condition occurring). I think it would be better to go to Debug-> Add Watch and create a watch that looks like this which would stop when the condition was True.